Enterprise Architect is more than a drawing tool. Every feature that you might expect in an IDE is also available. Comprehensive debugging environments and tools for many major platforms are provided. By integrating debugging capability within the modeling tool allows code to be developed, built and managed by its authors, working and collaborating in an integrated model has made actions count and every action accountable in ways that are just not possible using other tool chains. 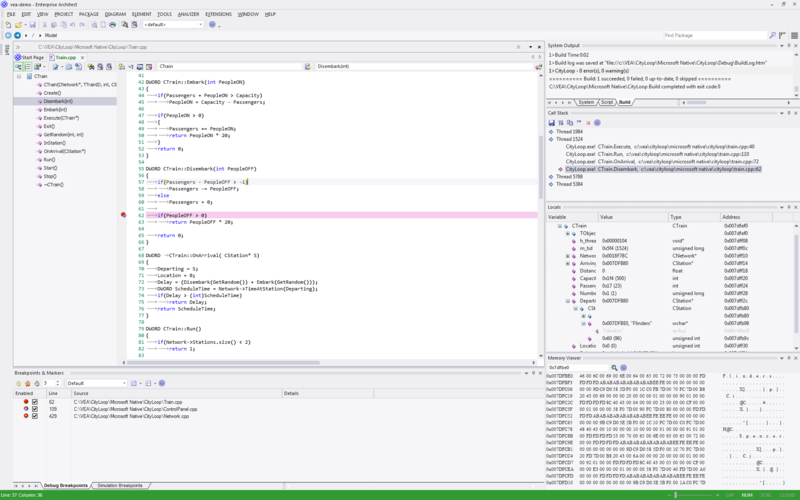 Debuggers in Enterprise Architect are quick! Stepping through programs will not take all day. The Recording program execution can be done without manual stepping. Starting and stopping the debugger is quick and painless. It does not hold you back. Designed to be a responsive UI, the main UI thread is isolated from duties that are not its responsibility. Switch from modeling to requirements, from raising a change request to tracking code changes in a model shared across an organization, to profiling recent code changes. All in the one tool.